Is The Curve Yielding Economic Clues? Inversions have preceded all nine U.S. recessions since 1955. The landscape ‘round here is looking pretty flat. The interest rate landscape, that is. On Friday, the spread between the 2-Year and the 10-Year Treasury Note rate—the most widely followed version of the so-called “yield curve”—shrank to 24 basis points, the narrowest margin in 11 years. Momentum has been building for further flattening, and perhaps inversion, of the curve, otherwise known as a “term spread.” Inversion would result in the 2-Year Note paying more interest to investors than 10-year paper. That’s worrisome because inversions have preceded all nine U.S. recessions since 1955. 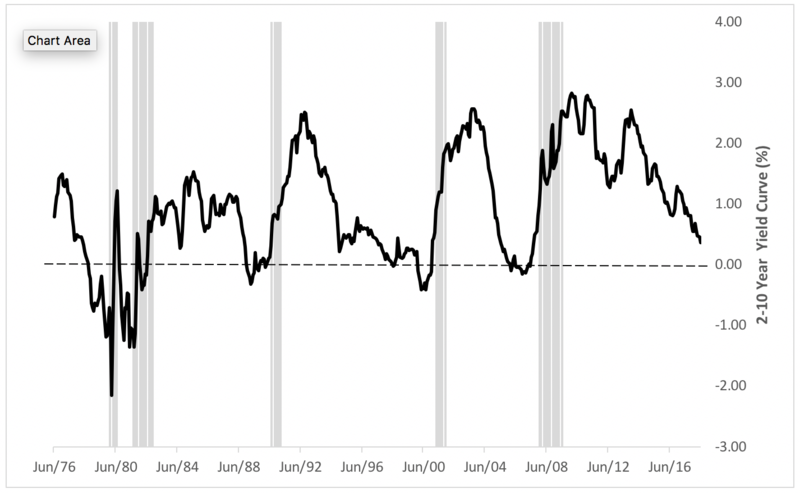 The chart below depicts the most recent recessions (in gray) of these plotted against the 2- to 10-year yield spread. So what’s likely to happen if—and it’s still an if—the curve inverts? Recent history shows that a recession follows in an average of 16 months and that the setback lasts, peak to trough, for an average of 12 months. There should be some comfort to investors in those numbers: First, because there’s still time to insulate one’s portfolio against the depredations of an economic stumble; and Second, because the ensuing recession historically tends to be relatively short. No matter how brief the average recession is, someone with a short investment horizon, particularly a person contemplating retirement, has reason to be concerned about the current trend. For those in this circumstance, equity exposure is typically reallocated toward companies that perform relatively well in a sluggish environment, such as consumer staples. There are signs that this reallocation may already be under way. After an absolutely meteoric ascent, the ratio of the Consumer Discretionary Select Sector SPDR (NYSE Arca: XLY) to the Consumer Staples Select Sector SPDR (NYSE Arca: XLP) seems to have topped and may be heading over towards its mean. 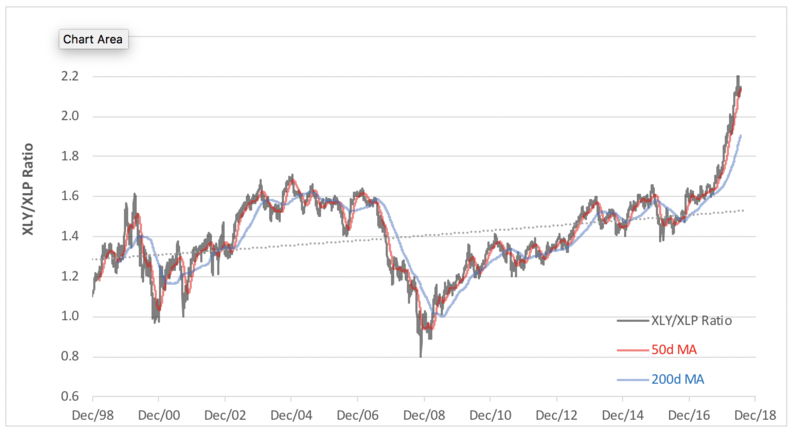 This ratio—a barometer of investor sentiment—is depicted in the chart below. More on this indicator can be found in our May 9 column. On the fixed income side, a flat or inverted yield curve raises fears about inflation, incenting traders to spread short-term notes against longer maturities. For more pedestrian punters, that means stretching out maturities and durations. So the bad news—or potentially bad news—is that the prospect of recession looms ahead. The good news is that there’s a long lead time to do something about it. It’s important, though, to keep your eye on the spread for signs of further flattening so that you’ll know when to start taking action.